I fell in love with a bird, and not in the British sense. New Zealand is well known for its jaw-dropping landscapes and geological diversity. Yet it was my encounter with the Tūī (too-ee), an ear-catching native songbird, that reshaped my appreciation for nature’s unique moments. The gorgeous Tūī after eating a bag of Cheetos. Photo via Wikimedia Commons. While in Wellington, on the North Island’s southern tip, my travel partner and I were encouraged by locals to visit Zealandia. This 500-plus acre conservation area sits the west of the city’s vibrant downtown. Having overindulged ourselves on Wellington’s excellent culinary and coffee scene, we were due for an offbeat experience. A fifteen minute shuttle from a local visitor’s center landed us at the well-fenced compound. We chatted up the ticket attendant, double-checked our daypacks for unexpected cats (seriously), and made our way through varmint-proof airlocks. Zealandia is a brilliant example of conservation technology at work. The park’s dedication to the safety of its avian, reptilian, and insect inhabitants helps fulfill its mission to recreate a pre-colonial forest ecosystem. The equivalent of Trump's fence for varmints. Photo by Tony Wills via Wikimedia Commons. Its tall, lipped fences also extend feet below the ground to prevent rodent burrowing. It incorporates varying material layers to ensure mammals of all sizes can’t squeeze through, and runs a five mile perimeter around the sanctuary. It may be one of few places in the world where humans are literally the only mammal for miles. It seemed to have worked. Once through the breach, we were greeted by a cacophony of shrill chirps, honks, and squawks. Zealandia’s informative signage and interactive exhibits helped us discover the sources of the beautiful racket. As we walked the park’s paths, one bird’s call stood out through the auditory overload. Tūī Be or not Tūī Be? “What is that bird that sounds like an 80’s video game?” I asked. On the bank of the park’s central lake, we quietly approached a lone black bird performing a loop of calls. It had a whiskery white collar, underset with a teal-blue sheen, and a fashionable white ascot to match. The bird clicked, honked, hissed, trilled, and warbled a ceaseless pattern. I was transfixed, and couldn’t believe my ears. This was my first encounter with New Zealand’s Tūī. 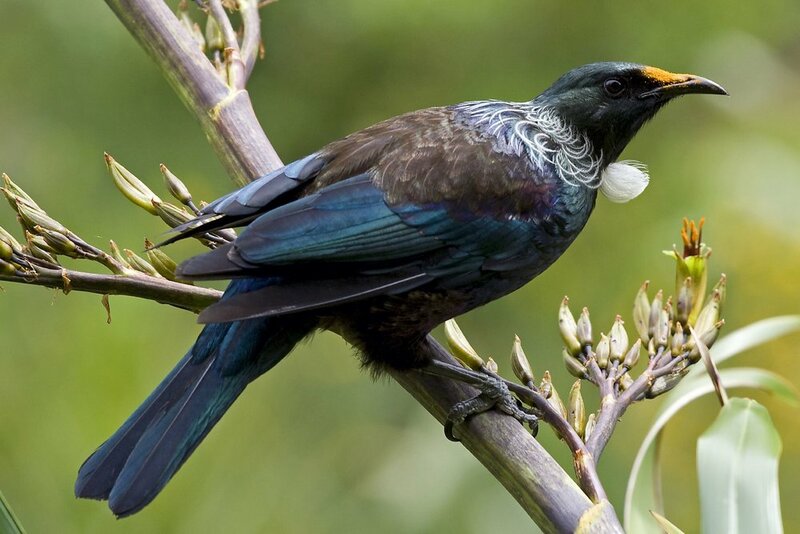 Tūī are impressive mimics, rivaling Australia’s Lyrebird and numerous species of parrots. New Zealand’s original inhabitants, the Maori, were known to tame and train Tūī to speak various phrases, impressing village visitors. A well trained Tūī was a status symbol among local chiefs, and was often bestowed the name of an important ancestor. It’s a bird which, among a select handful, contributes greatly to New Zealand’s ecological and cultural identities. In a country that has faced numerous species losses and conservation challenges, the Tūī is one of New Zealand’s more successful bird stories. For more Tui song, click here. At each destination – even on the Hobbiton tour– we learned something new about New Zealand’s geological formation, cultural history, or ecological diversity. Surprise, you're extinct! Photo via Wikimedia Commons. For millennia, the islands were free of ecosystem disruption due to their isolation. In the case of birds, the region’s lack of mammalian predators lead to curious evolutionary subtractions among its avians. For some species, flight was no longer a necessity. Eventually, human settlers made their way into the region –first the Polynesian Maori, then Dutch and English explorers. Overhunting and the introduction of non-native mammals obliterated defenseless bird populations. As a result, flightless birds like the giant Moa quickly reached extinction. Other species became endangered, including current populations of Kakapo, Takahē, and the famous Kiwi bird. Having learned from history’s mistakes, New Zealand is a fierce protector of its remaining natural assets – and it shows. Hiking through its dense forests, I felt transported back to another time. The region’s abundance of ferns, glaciers, and sparse population density, lent to this prehistoric feeling. Birdsong seemed to echo from every grove, adding a soundtrack that isn’t far removed from we may have heard in ancient times. 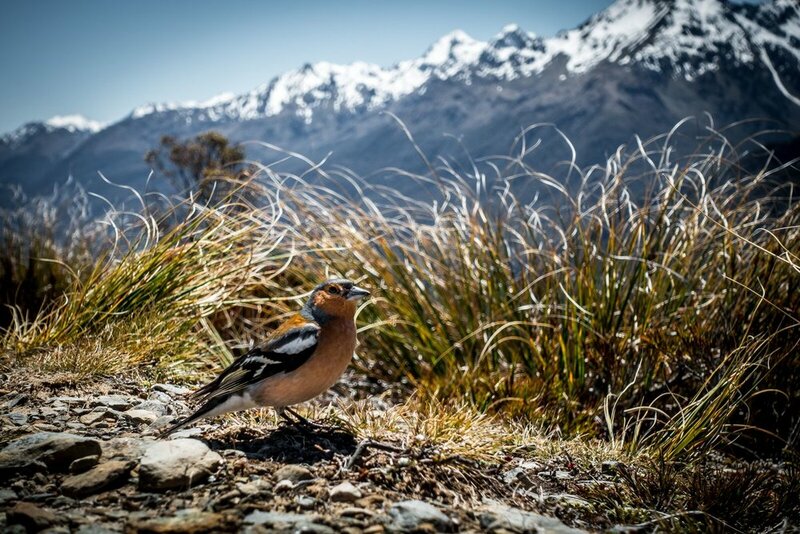 Click here to enjoy a chorus of New Zealand’s birds. Throughout the rest of our journey across the islands, it was rare to not be greeted by the song or presence of the Tūī or its associates. I often found myself sitting under trees, sometimes in the middle of cities like Te Anau, taking in as much Tūī as my patient travel partner would allow. My obsession with the Tūī was a gentle reminder to absorb new surroundings, and be open to the experience as a whole. Throughout the remainder of our visit, I found myself stopping to take in the sounds of New Zealand. It was tough to discern which call belonged to which bird, but the Tūī always stood out. I appreciated the new “friendship” I had made. Not a Tūī, but an equally chill birdbro. Photo by Josh Wolff. Remembering to stop, look, and listen leads to a trip’s unforgettable moments. I have the talkative Tūī to thank for my renewed appreciation of these travel-specific subtleties. After all, unless you’re a New Zealander, it’s not everyday you get to hear one of nature’s premiere DJ’s. Interested in more sights and sounds from New Zealand, and around the world? Check out the Postcards Project, initially inspired by the Tūī and the visit to Zealandia. Meta image by Marolyn Dudfield via Pexels. Josh Wolff is a Brooklyn, NY based writer, photographer, and content marketing manager. He's currently gearing up for his first brother/sister Europe trip, writing for his travel brand brb, traveling, and watching the St. Louis Cardinals play middling baseball.